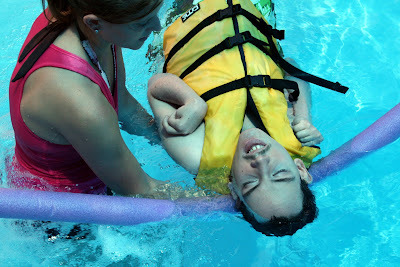 Recreational therapy assistant Mary Eckstein helps Bryan float in St. Mary’s therapy pool. Twins Brandon and Bryan got a treat today: They spent part of the morning in the pool. The 20-month-old boys arrived at St. Mary’s Home not too long ago for respite, or short-stay, care, and this was the first time they got to go for a dip in the comfortably heated water. 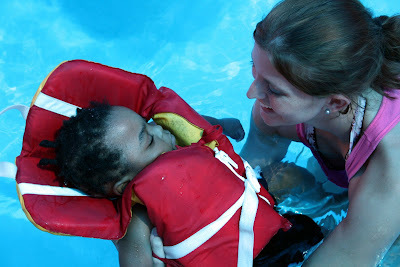 Bryan’s twin, Brandon, with Kathryn Simmons, recreational therapy support specialist. The pool isn’t just for the littlest children at St. Mary’s Home. Colton, 17, also had the chance to splash around today. 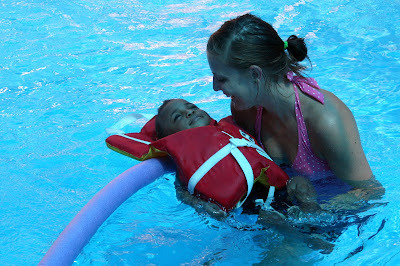 And staff of the evening activities and recreational and physical therapy departments frequently work with other children in the pool. 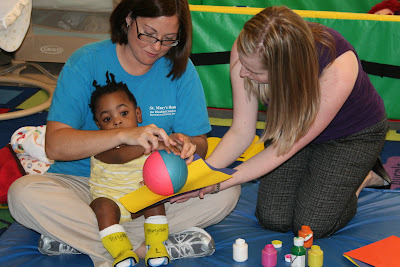 Stephanie Bailey, early intervention technician, left, and Nicole Hoskins Jones, director of recreational therapy, help 20-month-old Bryan create a painting by rolling a rubber ball over a piece of paper covering another piece of paper that was splattered with paint. The activity helps Bryan improve his range of motion. Plus, it’s a lot of fun. “How about yellow?” Nicole Hoskins Jones, St. Mary’s director of recreational therapy, asked as she held up a brightly colored bottle of paint. “Yeah!” said Carrington, who then also gave her approval to blue. 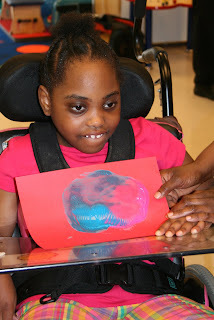 Her colors chosen, Carrington was ready to begin the task at hand: Creating “smash” paintings for potential display at the Fall 2010 Homearama Charity House. Profits from the sale of the house will benefit Carrington and more than 80 other children and young adults who live at St. Mary’s Home for Disabled Children. Twins Brandon and Bryan, 20 months, joined in the fun as first-time Homearamabuilder Scott Crumley visited St. Mary’s today to display the model of his Homearama entry — the Spanish Colonial-style home called “Santa Maria” — and chat with media representatives about the project. The 2,800-square-foot home will feature a courtyard with a pool and outdoor fireplace. 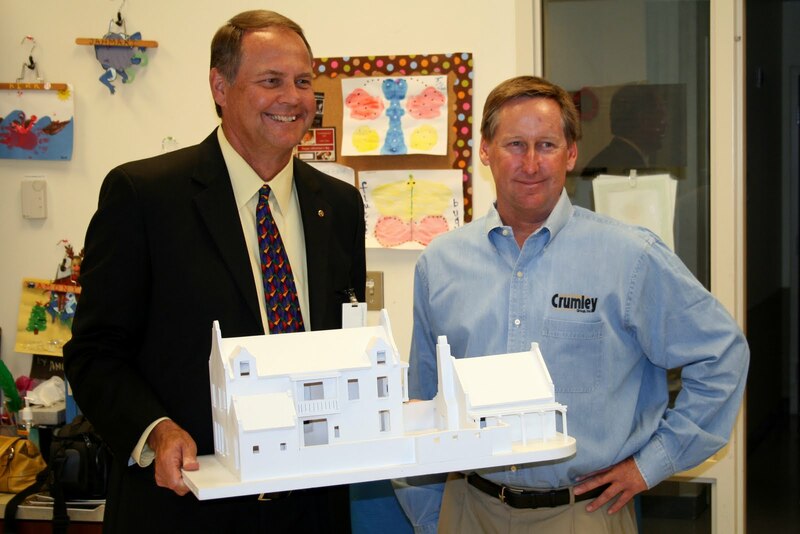 “The proceeds from the beautiful home Scott is going to build are going to be used to make St. Mary’s Home more beautiful,” said William C. Giermak, St. Mary’s CEO. St. Mary’s will use the funds to redecorate and personalize the children’s bedrooms to make them more inviting and homelike. William C. Giermak, CEO of St. Mary’s Home, left, and builder Scott Crumley with the model of the Charity House.